In my last post, I dissected the cultural icon that is champagne. Not all sparkling wines are created equal. For many of us, champagne is a bit of an enigma, elitist even. The terminology may seem a bit foreign. Like an exclusive club created it like a secret handshake: a means to determine who really gets It. You don’t even know the term cuvée? Sorry, stick to your Korbel. That’s kind of the vibe we get about champagne. But snobbery aside, champagne is a fascinating study in art and science. Tightly regulated, champagne itself is more varied and nuanced than you might assume. Until my short trip a few years ago to Reims and the Champagne-Ardennes region, I knew much less about champagne and sparkling wines than “still” wine. After a full day of tasting and helpful guided tours, I felt so less ignorant and even more interested in champagne – and, of course, learning how to pick a better sparkling wine. So how is Champagne made? How do champagnes differ from one another? How can we decipher the terms on a label and pick a great champagne? Ok, the obvious answer is to taste several of them, but then, so what? Sparkling wine gets its “sparkle” (carbonation) from the second of two fermentations. The first is in wood or steel barrels; the second takes place after bottling. 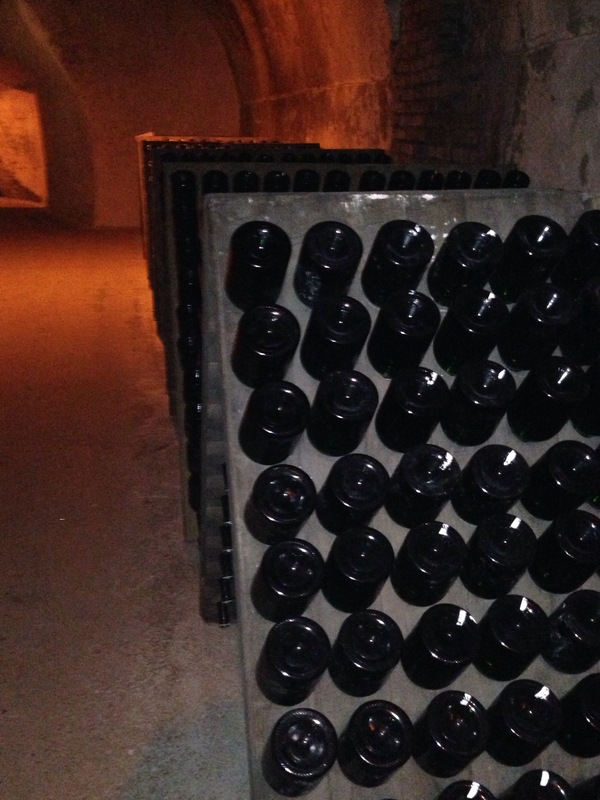 The photo below shows bottle fermentation in underground caves below the house of Taittinger in Reims. Sparkling wine, in theory, can be made from any one or combination of grapes. In Champagne, bubbly bearing the champagne designation can comes almost exclusively from only three grapes: Chardonnay, Pinot Noir, and Meunièr – either one or a blend of the three. Interestingly for some of you, the latter two grapes are red (black)-skinned grapes, which may surprise you, but unless creating a rose wine, skins are removed prior to fermentation. Small amounts (usually less than 1%) of juice from other grapes can be blended with the primary three. A sparkling wine made exclusively from Chardonnay (or other white grapes if not from Champagne) is a Blanc de Blancs. If made from red grapes (Pinot Noir and/or Meunier), it is a Blanc de Noirs. A blend of more than one type of grapes is called a Cuvée. 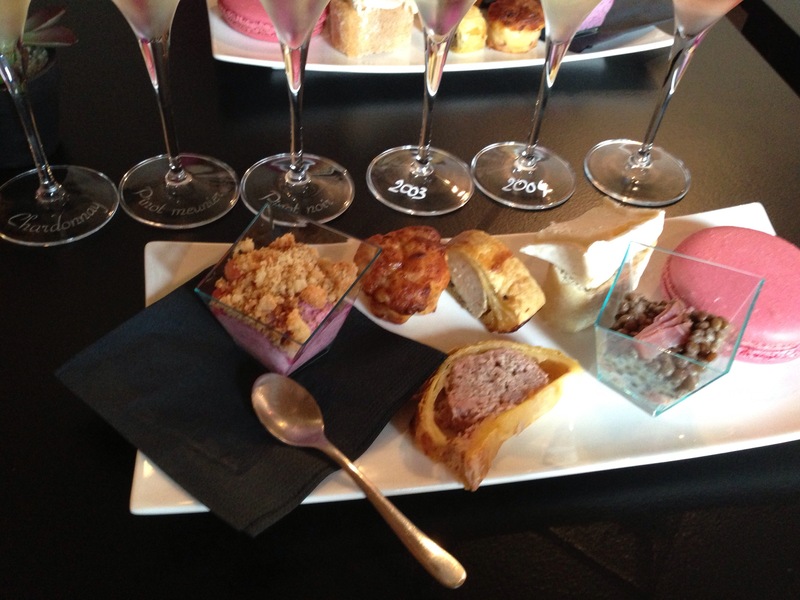 At one tasting house, we sampled six different champagnes that included champagne made almost exclusively from each individual grapes, as well as blends. I realized that I preferred the Pinot Noir-heavy varieties – especially Pinot Noir rose. Rose wines are created through a few possible methods. Those include either macerating the juice with the skins for a period of time, or, more likely in the case of rose champagne, the skinless white wine is blended after first fermentation with a finished red wine prior to bottling and secondary fermentation. The latter method is what an individual producer, whose Premier Cru vineyards we toured, used. His family’s rose champagne – which is not available outside of France (sigh) but not unreasonably priced – was amazing. When I opened the bottle I saved for myself back home six months later, it was far better than I remembered. It was better than anything I would afford to buy as an import in the States. A word on this Cru business: The term Cru, which usually is listed prominently on the front of a label (if it applies) is like an evaluation system distnguishing the village (location) from which the grapes used originated. Wines either do not qualify for any Cru designation, or they have one of three “levels” – Cru, Premier Cru, or Grand Cru. These gradations are selective. The French government allows only a few villages to meet these designations, particularly true for Grand Cru. 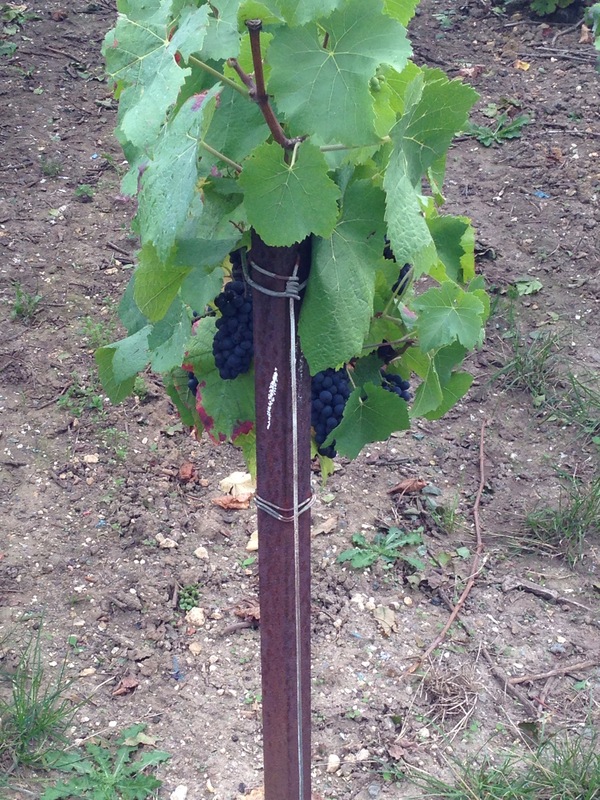 As with other wines, winemakers often buy grapes from other farms – and other villages. If the grapes all come from a Cru-designated village, then the wine can be labeled as a Cru. You’ll also hear the term “vintage” tossed around. Vintage does not mean it is an “old” or aged champagne. It refers to champagnes made exclusively from grapes grown in a single year. Most champagnes are a blend of grapes of different ages. If the crop and wines were particularly good one season, then vintage champagnes may be produced. This also means that the bottles you see pictured aging in the cave, above, are not the bottles used in the sale. The primary and secondary fermentations can be stopped or tweaked during the process to give just the right balance of sugars (primary) or effervescence (secondary). Winemakers can then mix fermented wines from different vintages to produce the final product, which is then bottled and sold for your enjoyment. I could keep going, but I’m no expert, and all lessons become tiresome after a certain point. To learn more about champagne, study up through the wonderful website and brochure provided by the French government. It has more information than you can absorb in one setting but is a good read in multiple languages. It also was the source of a lot of my fact checking for this post. Study up! Remember that the most important part of your champagne education is actually trying it!